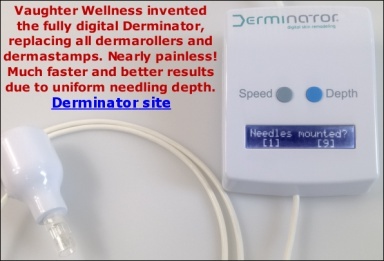 Dermarolling / Microneedling / Re: Disinfecting DermaJet Needles..
Just remove the alcohol by rinsing it in clean tap water. Tap water in the industrialized world does not contain any kind of infectious qty of dangerous bacteria or spores. Sometimes water can contain parasites but they are unable to infect a person via the skin - only via the stomach. Cleaning is very, very much more important than disinfection or even sterilization. If you have doubts on the quality of your tap water, use deionized water from the pharmacy or even bottled water. And you can use your fingers while doing that. If you are afraid of infection, wear new latex gloves. I have learnt to work in a sterile environment and I know that unless you take extreme precautions (max. speed of moving limbs, position of limbs, wearing a "space suit", wearing two sets of gloves over eachother with disinfectant in between and on them, never touching your own body, washing hands for 10 minutes, wearing hear and face protection, autoclaving all instruments etc.) you can not avoid contaminating instruments. However I also understand microbiology and infectious disease etiology and I know that the risk of infection when you use my recommendations is extremely small because your own skin contains many orders of magnitude more bacteria anyway, and you can't kill all of them just by swiping them with ethanol or Iodine. Fact is - those bacteria are harmless. They are "good" bacteria. They are the flora that protect you against infections. A British company bought the rights and they're planning to relaunch it at a very much higher price. We keep the remaining stock to send to existing customers in guarantee cases. Meanwhile, we're designing our own auto-needler. Hopefully available one year from now.. Nothing happens, and if you worry then you can clean the instrument before use. That is, if you ignore my advice to tape up the crack in the box. It's not like there are Rabies or Anthrax spores floating around in your house, and even if they were, statistically there could only perhaps land 1 or 2 on the instrument. And the minimum infectious dose of such spores is orders of magnitude greater. But even with such amounts, the shallow penetration of a dermaneedling instrument would still virtually guarantee no infection. And that is why I have never heard of infection with these instruments (at least not with our customers), in spite of the fact that hundreds of thousands of people dermaroll. People totally have the wrong idea about the risk of infection with dermaneedling. Only in extremely rare cases could infection occur, for example whern a person has severely reduced immunity. I think there has been only one case mentioned online. I have seen a single case only in my 7 years, mentioned online. An unverified case from an anonymous source, with no evidence offered. People are fallible and make mistakes regarding cleaning and disinfection, they keep their instruments exposed, close to their toilets etc. and there are just zero reports of infection, at least not that I know of. If it were a problem, we would read about infections more often (I never read anything about infections occurring on the big dermaneedling forums, neither on this forum, and we have approx. 30,000 dermaneedling customers). I think that if a customer of ours would suffer an infection, they would at least email me. I have never in 7 years received a single email like that. Dermarolling / Microneedling / Re: Weird skin texture after dermastamp? Vit. C likely causes the peeling but I do not think it causes the hardness. Just to be sure, stop using it for now and start applying almond oil or some other oil to soften and moisturize the skin. Sprinkle a cotton pad with tap water, add a little oil and apply it on the skin. I hope oil will not break you out - first try it on a small part of your face or apply it only to the hard spots. You can also give your face a very gentle peeling in the shower - for example with used ground coffee (used in filtered coffee). It can take a long time for the processes triggered by microneedling to be completed so the skin will further change. Concerning the application of vit. C, I just pour a little of vit. C serum into my palm and smear it on my face or I pour it onto a cotton pad and apply it. Currently there is no method that can completely remove deep scars but there are methods to significantly improve their appearance. I suggest buying a 1.5 mm dermastamp (not a dermaroller) with 35 needles and needle the scar every three weeks (without iodine). This should further improve the scar. When the scar seems not to improve any more from dermastamping alone, start using iodine again. To enhance iodine penetration, do not fully insert the 1.5 mm needles but use just the tips of the needles to prick the scar. Apply iodine right after. Be careful and watch the scar every day so that it does not end up indented (indentation cased by apoptosis). Dermarolling / Microneedling / Re: Would dermarolling be suitable for me? May I ask why the stamp would be preferable to a roller, is that just because it is an isolated area i am treating? Yes. For targeted, intensive treatment of a scar, a dermastamp is much better. Should I purchase the 0.5 mm or 1 mm? If the scar seems shallow, buy a 0.5 mm. A 0.5 mm length reaches the top of the dermis so it should reach shallow scars. Obviously if not I will opt for the 1 mm, but how much more downtime would that require? This is individual. If you do not work at the weekend, stamp the scar on Friday afternoon and you will see how long it will stay red. With a 0.5 mm, the redness is likely to be more or less gone in the morning. And should I use any of your other products, for example the Infadolan? Would this speed the healing or make it more efficient? Infadolan promotes re-epithelialization, keeps the stamped area semi–occluded to prevent water evaporation and supplies vit. A and D but you can keep it moisturized with something else. I have heard that scarring takes an average of 7 months for redness to subside. Is this correct in your opinion and would the microneedling speed up this process or would it continue as normal? Maturation of a scar takes many months and the redness can in some cases persist much longer (in burns, stretch marks, deep injuries etc.) but your type of scar will almost certainly significantly fade within eight months. You may be left with a white scar after that. If depends how deep the mole was. Microneedling will speed up the process because it speeds up the turnover of the skin and it will soften the hardened scar tissue. You mean the box, right? That is no problem. Use some tape to tape up the cracks. Our shipments include a leaflet explaining where to download our microneedling instructions (34 pages). Microneedling will very likely soften the scar and help blending it with the surrounding skin. Buy a 1 mm dermastamp (not a dermaroller) and stamp the scar every 10 -14 days. Stamping will make the scar temporarily more red but it will subside.You do not have to pre-treat the skin in your case. I will answer your questions later. Dermarolling / Microneedling / Re: Stretch out the skin before rolling ? If the skin is stretched out, it is easier to roll and the needles will penetrate deeper. It is not always possible (rolling the arms for example) to stretch out the skin but if you can, do it. My sleep creases fade when it is almost time to go to bed again.. The difference between a 1 mm and a 0.75 mm length is quite marginal. We have customers who improved their fine wrinkles with a 0.5 mm size but using a 0.75 mm for that purpose is even better. You can roll once a week (or less if you prefer). If you have frown lines between the eyebrows, needle them with our single needle. You can apply a little of our Infadolan daily around your eyes and at the back of hands. Your hands will appreciate it. We included the 0.75 mm roller in our assortment only because we once encountered a very strange person who said that the lack of a 0.75 roller was "proof that we were in cahoots with Dr. Roller". That person (Panos from Greece) proceeded to post on as many forums as possible how much he hates me for not enabling Greece as a supported shipping destination. We then grudgingly decided to add every available length to our assortment, even though I do not endorse them. Those needle lengths that are not recommended in our instructions are to be used at your own discretion.